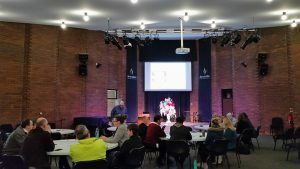 Developing leaders is a focus of Avondale College, and the Avondale Business School (ABS), through Warrick Long, is front and center in providing training for the Avondale staff through the Avondale LEAD program. LEAD stands for Leadership, Experience and Development, representing the focus of the initial six month program. Participants meet together every month for a session where they discuss a key aspect of leadership, drawn from the four building blocks of leadership. Additional leadership resources are available to participants, including book reviews, recommended readings, videos and articles. A leadership challenge is set at each session, so participants have some goals to implement their new found knowledge. For those participants that are wanting to go a bit deeper and get some recognition for their participation, there is a series of assessments for them to undertake. Ensuring that the program meets its goal of developing leaders, Warrick Long and Associate Professor Lisa Barnes (ABS Head of Discipline) are researching the effectiveness of the program through surveys and feedback, which will also form the basis of a research project for publication. This entry was posted on Thursday, August 9, 2018 at 10:01 am	and is filed under ABS News, Leadership, Professional Development. You can follow any responses to this entry through the RSS 2.0 feed. Both comments and pings are currently closed.